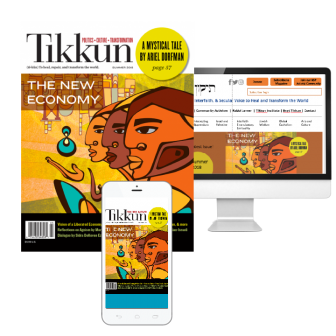 Editor’s note: Tikkun is delighted to publish Michael Kagan’s book Where’s G?d as a series on our website. This is the Prologue, Introduction, & first chapter. For “Night Two,” click here. I met Tara in March 2016 during a trip to London. This may appear a bit strange since I completed Where’s G?d in 2014. 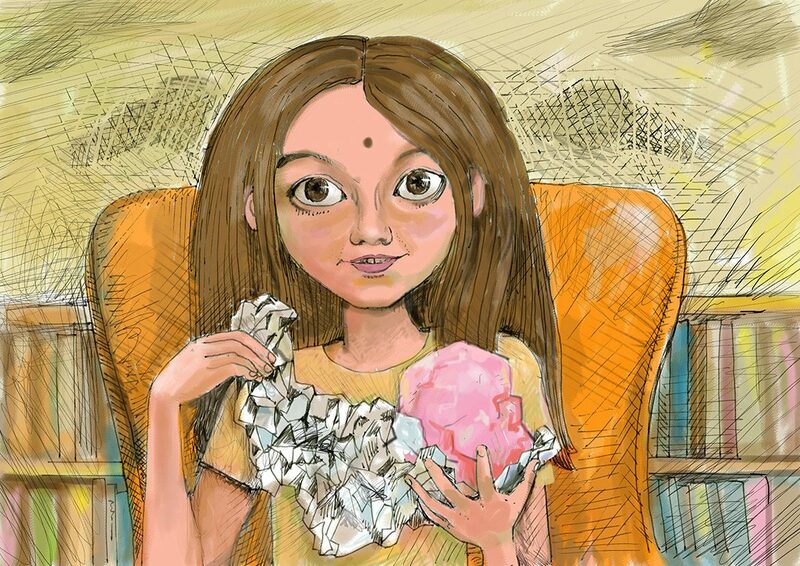 But there she was, bubbling with innocence, beautifully wide-eyed, precocious, wise, awake; just as I imagined her but with a difference: this Tara was a mere six and a half years old whereas the girl in my story, my avatar, I imagined to be older, closer to twelve. Tara was so young that you might wonder whether I made her up but there she was sitting in full lotus on the sofa, her little hands pressed together over her heart, her dark eyes closed, her small body rock-still as she led a room full of adults in meditation and prayer. I had been invited to a meeting of a select few to discuss plans for a university for the teaching and practice of compassion. The apartment, located near Paddington Station, was filled with the ambiance of India: the colours, the paintings, the books, the statues, the smells, for you see, another difference between my creation and the Tara that confronted me at the door was that this Tara was Indian, at least her mother was Indian. Her large, dark eyes and golden skin, her black hair and mischievous grin, her hand gestures and body language, were all from another world. And when I say ‘confronted’ I mean literally that. After I had knocked politely, the front door was flung open and this bubble of joy threw herself at me. Without any inhibitions, she took me by the hand, led me into the living room and introduced me to the other guests. I was late (as usual) and the last to arrive. Once I had settled down, Tara’s mother, like the incarnation of Shakti herself, welcomed us to their home. I was sitting on one half of the sofa; Tara was trampolining on the other. I suggested that it would be appropriate to start such a meeting with silence and prayer but with one look at Tara I realized that this would be impossible unless she was put in her place, namely her bedroom. Her mother said something that I didn’t catch and Tara immediately stopped her gyrating, sat crossed-legged and fell easily into mindless silence. We followed suit – as best as we could. After an endless ten minutes, Tara opened her eyes and smiled her delightful smile and quietly left the room. We grown-ups, experienced practitioners of unifying mind, body and soul, proceeded to introduce ourselves in the light of compassion. After an hour our hostess interrupted to announce that supper was being served. The kitchen was filled with the aromas of chili, turmeric, ginger, cinnamon and many more that I couldn’t identify. Tara appeared, impishly filling her plate with the hottest of curries. I stuck to mild. Again I suggested that we bless the food before eating, and again Tara was asked to lead us in prayer. The little girl sat with her hands suspended above her plate and blessed God for the food and blessed us for good health. As we finished eating Tara began to pester her mother. “When can I make my presentation? When mum? When?” I was getting a little anxious since I had a flight later that evening and I wanted us to continue the discussion. Tara’s mother asked us to pay attention to the presentation. Tara sat cross-legged in front of us. In her hands she held a ball covered in aluminum foil. The room hushed. She looked at us with her penetrating stare. We sat in shocked silence. So my story, which began with a fifteen-year-old girl called Mayan, meaning ‘Source of Blessings’ in Hebrew, morphed into twelve-year-old Gaia – ‘Mother of All’, and is now seven-year-old Tara – ‘Mother of Liberation’. May we be blessed by all three. My name is Tara. I am a girl blessed with two wonderful parents. When I was growing up, my parents were kind and loving. They gave me a warm home to thrive in. They protected me. They fed me. And they loved me. But I wasn’t ready yet for this world. I wasn’t ready yet to let go of the place I had come from, a place so very different from this world. I wasn’t ready yet to forget. So in order to protect my memories, I made a decision: I wasn’t going to talk. Yet. I decided to listen and to observe, because I didn’t want to allow myself to be distracted by also having to speak. It wasn’t that I was playing dumb, I just preferred not to speak until I was ready. For some reason, this really upset Mummy and Daddy. They thought that there was something very wrong with me. They took me to doctors and specialists who scanned and probed me. But nobody could find anything wrong with me. Because there wasn’t. Maybe it was unfair of me to put them under such stress and distress, and for that I am sorry. But I simply wasn’t ready to speak yet. Let me re-state this in grown-up language. I preferred to stay in my right-brain as long as possible, so that I could access the wonders of wide-band, rather than to stay in the confines of narrow-band in my language-structured left-brain. At a very early age, I understood and appreciated books and printed images. As soon as I could, I started reading voraciously. 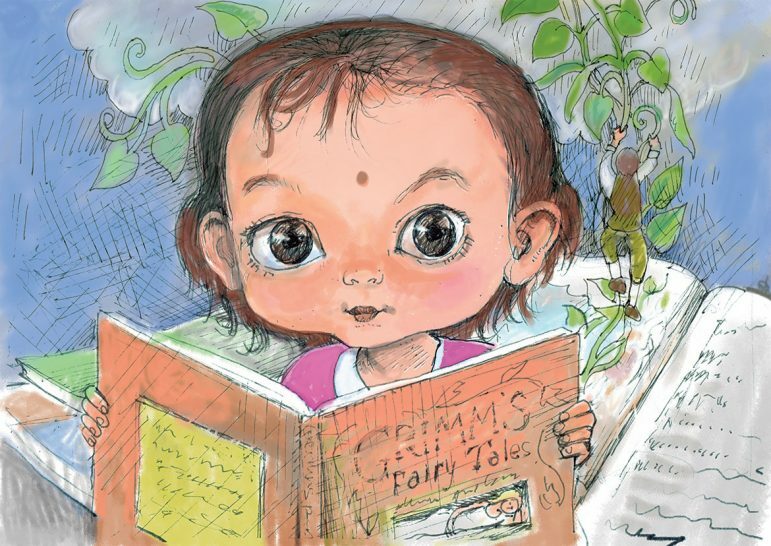 Storybooks were OK, but only if they contained deeper meanings, like the ancient fables and the so-called fairy stories. I had no patience for ordinary, what I call flat, books. Yes, I know it’s true that reading requires language and that language is predominantly a left-brain activity. However, my continued silence allowed me free access across the chasm of existence. My parents were decidedly happier when they saw me reading. They were relieved that I was not in fact intellectually impaired. But the puzzle of my silence continued to perplex them. I did not like to see them suffer, so I tried to help the situation. Every once in a while, I would utter a word or two to demonstrate that I had normally-functioning vocal chords. Strange to say, this seemed to increase their anxiety and to make matters worse. Until…until at the age of seven, I was ready. And because I was ready, I started to talk. The following chapters are a not very accurate record of some of the early conversations I had with Mummy and Daddy once I started talking. I hope though that I have succeeded in conveying the wonderful time I had living between dimensions. I found it challenging to describe the special world I experienced. Not because I lacked the necessary vocabulary, but because it was so much brighter, so much vaster, so much newer, and so much more multi-dimensional than people who were no longer babies were able to experience. I quickly discovered that metaphors could serve as convenient tools to help me describe the almost intangible. I started using objects to create an entire fairy story that revealed reality beyond reality. Now that I’m older, I feel ready to set down in writing my memories of that time and to share them with others. I hope that my stories will stir your memories too. I hope that they will bring you back to that magical place where we all come from. I hope you will be able to recapture the knowledge and the wisdom we all once possessed. So there I was, lying in my bed, surrounded by everything. It was dark. The wind was stirring. The angels were dancing. And I was talking to God. They both looked around , expecting to find that somebody. But the only somebody they could see was me. Mummy looked relieved. Daddy looked worried. “So who were you talking to, dear?” they both asked at the same time. They looked at one another. Daddy’s eyebrows arched upwards. Mummy’s too. It was like looking at both sides of a mirror. “Sure,” Daddy said. I detected a slight hesitation in his voice. “Thank you. Goodnight,” I replied. The door closed. My room disappeared. I counted to three. The door opened again. My room reappeared. “Yes?” I asked as innocently as possible. “Well,” started Daddy, “what do you mean by ‘talking to God’”? Both my parents were now back in my room, standing at the foot of my bed. They looked hesitant. So I smiled and patted my comforter to indicate that they could sit down if they wanted. Daddy glanced at Mummy. She accepted my invitation and sat down. “Where is God?” It was Daddy’s turn to ask. 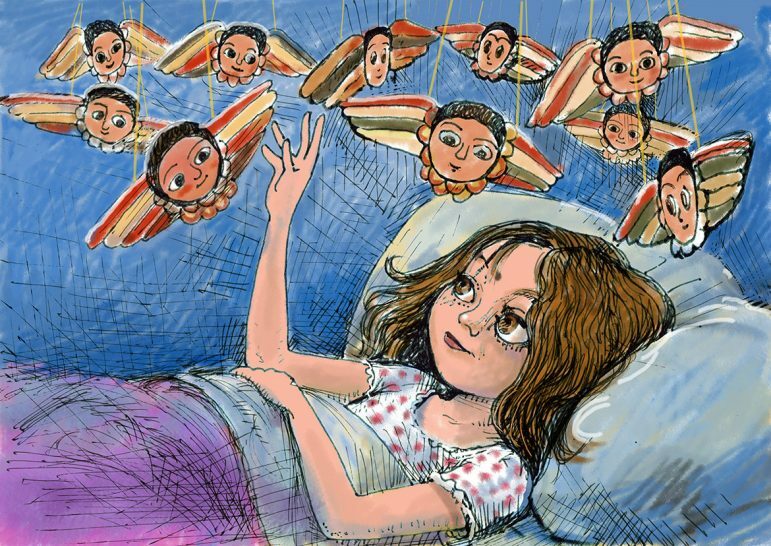 I giggled and looked up at my angels. They seemed to be giggling too. Daddy gave me a strange look. “You mean God is in this room right now?” Mummy’s turn to as, as she looked around my room. “And is God in the tree?” she asked, pointing to the window through which we could see my favorite aspen swaying in the wind. “Yes, God is in the tree,” I answered. “And in the mountains?” Daddy’s turn. “What about in Blackie?” Blackie was our mischievous cat. “Of course God is in Blackie,” I answered. “And what about this?” Daddy was pointing to my Cindy doll. I had a feeling that he was trying to catch me out. “God is also in Cindy. God is everywhere,” I repeated. Grown-ups seem to need to hear things more than once before they catch on. “Ah!” said Daddy as if he had just understood something. “But if God is everywhere, how could God be in anything? If God is inside something, then God can’t be outside it as well.” Looking quite pleased with himself, he touched Mummy’s elbow as if to indicate that he had won and that it was now time to leave. “I only said that in order to make it easier for you,” I said. “Actually you’re right. God isn’t inside anything.” Daddy smiled. “And God isn’t outside anything either.” Daddy’s smile grew even wider. “God is everything.” Daddy’s smile disappeared. “God is everywhere because God is everything. God is also Blackie. God is also the mountain and the tree and my Cindy doll and you and me.” Oops, I got the distinct impression that this was going over their heads. “Shh, darling,” said Mummy, discreetly jabbing her elbow into Daddy’s side. “You promised… Now why don’t you sit down and listen. I’m sure that with a bit of patience, we can sort this all out.” Daddy reluctantly moved my red chair over to the bed. He looked funny. He was much too big for my chair. His knees were sticking up in the air. “How can I help you understand?” I asked. Oops again. Daddy growled. He didn’t like the idea that I could help him understand anything. I sat up in bed. This was all getting too heavy. “I know,” I said with a flash of inspiration. “Could you give me the Mickey Mouse ruler that I got from aunty as a present?” Daddy reached over to my desk and like a huge crane, he lifted the ruler up and handed it over to me. “One ruler,” he said. “Or is this God too?” I gave him my squint-look to show my disapproval. “Sorry,” he looked suitably embarrassed..
“Those are the millimeter marks,” Daddy said, nodding to Mummy to show that he was still on top of things. “Why, there’d be lines all over the place,” exclaimed Mummy. She was on the ball. They hesitated. They evidently sensed that this was a trick question. “I get you!” Daddy interjected, “The physical ruler ends at 20 but the numbers continue to … forever.” We all followed the end of the ruler with our eyes, and saw with our inner eye how it extended all the way to the wall of my room. Then through the wall all the way to the end of our street. Then to the end of our town. Then to the ocean. Then into outer space. And then … forever. To infinity. “‘To Infinity and Beyond!’” we all said together in our best Buzz Lightyear voices. I continued. “And the same is true for each of those lines stretching out from the sub-divisions, and sub-sub-divisions, and the sub-sub-sub-divisions. And how many of those lines are there?” I could see their minds beginning to crunch numbers as they tried to count the lines. “To minus Infinity and Beyond!” We were all laughing now. “So,” I continued, “is there any piece of space that will not be filled by this infinite array of numbers?” Mummy and Daddy shook their heads. “I don’t see how any number could be missing? Unless I’m missing something?” Good old Mummy. “What do you mean ‘up to infinity’?” The atmosphere had grown serious again. Or rather, the atmosphere had grown-up again. There followed a torrent of questions. I must have fallen asleep before the last question was completed. Good night Mummy. Good night Daddy. Good night angels. Good night moon. Michael Kagan is the author of the Holistic Haggadah, now in its second edition, the conveyor of God’s Prayer, and Beyond Time and Space (poetry under his pseudonym Leon). He is the editor of All Breathing Life, a collection of Reb Zalman Schachter-Shalomi’s translations of sacred Jewish prayer and poetry. He is also the producer of two documentary films about his father’s town Novogrudok and the events that transpired there during the Shoah. He was ordained by Reb Zalman as a Maggid (storyteller), Moreh (teacher) and Mashpiah (spiritual guide). He lives in Jerusalem with his wife Rabbi Ruth Gan Kagan. "Where is G?d" is looking for a publisher.